When I was a kid, we didn't have Build-a-Bear - at least not where I live. I remember when their store first opened up at our local mall, kids went NUTS to personally stuff and dress their own bears and stuffed animals. Tourists came from all over to visit the store and take home their newest creation in its signature box. Well, if you're looking for another great holiday gift, why not consider Build-a-Bear's holiday line? This is another perfect gift for a kid on your list. Better yet, let Christmas come early and treat your little one to a visit to the store where you can he or she can create the holiday stuffy together. We received a Gingerbread Hello Kitty and it is super cute. It sits quite tall, actually, at about 30 cm and comes complete with a scented gingerbread accessory. I love her accessories the most; she came wearing a sequin and tulle/maribou dress and matching red sequin shoes. I actually tried the shoes on my LO! They didn't quite fit a baby's foot, but so super cute nonetheless! I also really love the Merry Mint Pup and the Christmas Cookie Bear. Each retail for $25, plus accessories. Each holiday animal comes with a scented accessory. 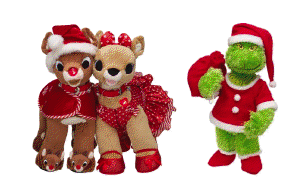 And who could forget about The Grinch, Rudolph and his gal-pal Clarice? These three are back for 2012. The Grinch is known for his heart that lights up three times (visible though his clothes) and it's all reindeer games with the amazing duo of Rudolph and Clarice. You can purchase individually or as a set. 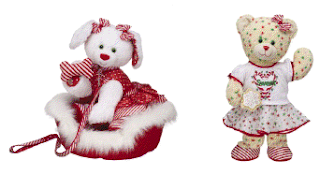 Build-a-Bear also has festive favourites like Santa and Mrs. Claus and an assortment of stocking stuffer ideas (while quantities last). But for Simply Suppa readers, you're in luck! We're giving away a Rudolph to one lucky reader!! All you have to do is enter below! Disclaimer: I received a Gingerbread Hello Kitty to review for this blog post. All content is original. Rudolph and grinch! Two classics!